The Geminid meteor shower of 2018 has lived up to its reputation for being the most spectacular meteor shower of the year, and skywatchers around the world have captured some amazing views of the celestial firework display. During the meteor shower's peak on Dec. 13-14, skywatchers could see up to 100 meteors per hour, weather permitting. Astrophotographers stayed up until the brink of dawn to capture the "shooting stars" and bright fireballs, or tiny pieces of space rock that burn up in the atmosphere as they fall toward Earth. These are fragments of the asteroid 3200 Phaethon. Every year in December, planet Earth passes through the asteroid's trail of dust and debris, and Geminid meteors rain down on Earth for a couple of weeks. 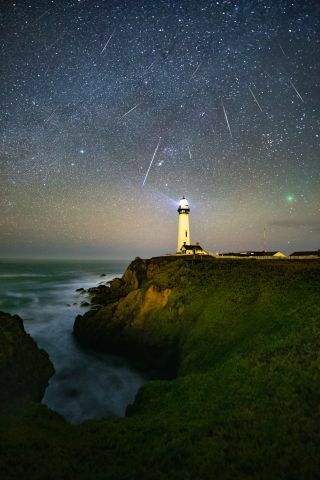 "I have always been obsessed with the Perseids, which are a much better visual experience with persistent trails and slow-moving, bright-green meteors," Manievannan told Space.com. "But the Geminids didn't disappoint, especially considering I was out a day before the actual peak night and considering the cloudy weather forecast across California. As a bonus, I got to see the green fuzzy dot on the right, which is the current brightest comet in the sky, 46P." A Geminid meteor and Comet 46P/Wirtanen star in this view of the night sky. Photographer José Zarcos Palma captured this photo from the São Domingos Mine in Alentejo, Portugal, on Dec. 13, 2018. In Portugal, astrophotographer José Zarcos Palma captured a Geminid meteor along with Comet 46/Wirtanen, both gleaming behind the silhouette of a holm oak tree branch. But that's not all! Palma's photo also shows the Pleiades star cluster (above the tree branch), and the bright-orange star Aldebaran forms a nearly equilateral triangle with the Pleiades and the comet. Geminid meteors rain down on Lake Corpus Christi State Park in Mathis, Texas, in this stacked image captured by astrophotographer Sergio Garcia Rill on Dec. 14, 2018. Dozens of Geminid meteors can be seen in a composite image by astrophotographer Sergio Garcia Rill (above). Rill photographed the meteor shower from Lake Corpus Christi State Park in Mathis, Texas. He programmed his camera to take a photo every 10 seconds for 3 hours and combined all the meteors he captured into one frame, creating an image that looks like the meteor shower is literally showering meteors all across the sky. A Geminid fireball blazes through the sky above a campfire at Assateague Island National Seashore in Maryland during the Geminid meteor shower. Astrophotographer Jeff Berkes snapped this photo on Dec. 14, 2018, at 2:30 a.m. local time. While shooting some "shooting stars" from Assateague Island National Seashore in Maryland, astrophotographer Jeff Berkes captured a brilliant fireball above his campsite at about 2:30 a.m. local time. "I had just sat my camera to hopefully capture a reflection of a meteor in the ocean and planned on leaving my camera there shooting for at least 2 hours," Berkes told Space.com. "I put the camera down and hit the shutter, 4 second later this bright fireball came streaking down leaving a reflection in the water. It was certainly the brightest Geminid I saw over my three-night stay." Astrophotographer Jeff Berkes captured this photo of a Geminid meteor over Assateague Island National Seashore in Maryland on Dec. 14, 2018, at 5 a.m. local time. A couple hours later, Berkes captured another fireball. Although the green spot at the tip of the meteor's tail looks a lot like the bright-green glow of Comet 46P/Wirtanen, it's actually coming from the meteor. "This meteor exploded five times on the way in and the final 'POP' was a bright green as seen on the end on the trail," Berkes told Space.com. Although the Geminid meteor shower is over, you can still see Comet 46P/Wirtanen in the night sky for the rest of the year. And you don't have to wait long for the next meteor shower. The Ursid meteor shower — though not nearly as spectacular as the Geminids — is expected to peak on Dec. 21-22. Producing less than 10 meteors per hour, the Ursids probably aren't a good reason to stay up all night, especially because the full moon will likely outshine the fainter meteors.